Occasionally I am asked to repair or touch up religious statues. In this case, the hands were broken off multiple times. Old glue staining, and prior repainting, had ruined the original surface. I rebuilt the hands with wood putty epoxy, which can be sculpted and sanded, and then painted and antiqued the whole statue. The wood cross was cleaned and revarnished. There is not a lot of money in this kind of work, but it is a nice break from my regular assignments. With an existing color palette of a beautifully designed kitchen by the bay, this project was a joy to complete. It took two days to paint and will have three coats of air dry clear enamel to protect the surface. I will be painting the front of a farmer's sink in Portsmouth, RI. The still life of golden fruit will be painted in air dry enamels and triple coated with clear polyurethane. The finish is as durable as if it were kiln fired. I should have the completed photos by the end of the week. Until then, be well. Yesterday was the opening of the 2012 Providence Art Club's Members Exhibition. The show will run in both of their galleries through February 24th. 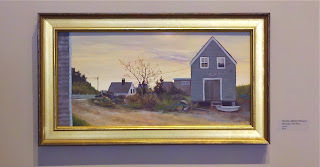 I entered "Monhegan Fish Shack" which was a small piece I did "plein air" on Monhegan Island, Maine this past September. A humble subject, the fish shacks are almost a "must paint" subject when one gets to the island. So there I stood in the drizzle, trying to capture the sun fighting to burn through the fog. Within the hour, the rain had won and I was forced to "tweak" the painting back at the makeshift studio we set up. There was a great feeling of awe as I stood painting in front of the shack, knowing for 80 or so years, many great painters stood in the very same spot. After the rain started to wash off my acrylics, and the gear was packed, I joyously collected the sea glass behind me. The islanders throw bottles and pottery into the rocky cove for this purpose. If you love art, please make time to see this show. It's a great little treat for your spirit. 133 pieces were entered, in all mediums and subjects. The galleries are free & open to the public Mon-Fri 12-4 & Weekends from 2-4.